I was given the honor of interviewing an influential writer on the Delphine Publications roster whose new book , Pieces of Justice, was released on June 11, 2013 – Author Sandra Jones. Ms. Nix – Can you please tell the audience a little bit about yourself? Author Saundra – I was born and raised in Mississippi and I work as a property manager for a government agency. I’m married with two daughters and one of my favorite hobbies is reading. Ms. Nix – How did you choose the genre (urban fiction) you write in? 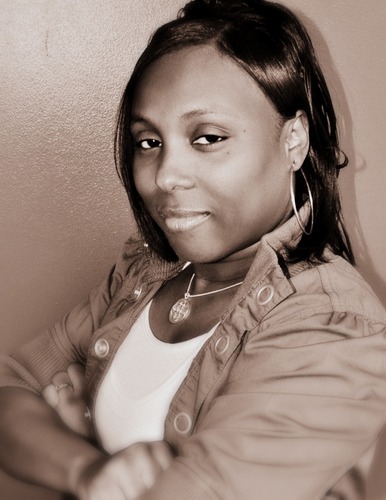 Author Saundra – I chose to write street lit and predictable romance because I am an avid reader of both genres. Ms. Nix – Where do you get your ideas? Author Saundra – All of my ideas come straight from my constant imagination. I have all sorts of characters in my creative mind. Ms. Nix – Is there anyone or anything that has inspired your work? Author Saundra – Mary Monroe & J. California Cooper are two of my favorite authors. Reading their work over time inspired me to just go for my passion (writing). Ms. Nix – Tell us about your main character, Justice. 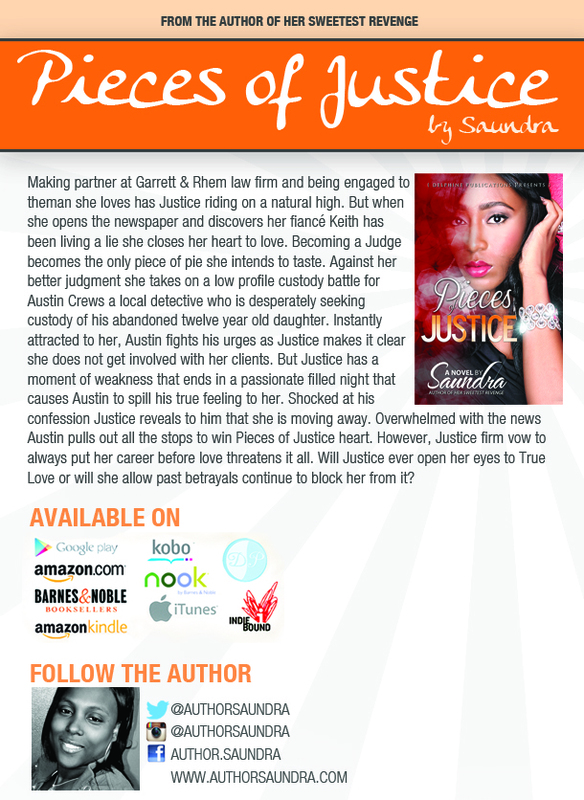 Author Saundra – Justice is a young, black successful attorney who is betrayed by her fiance. However, she is not broken because in the mist of her broken heart she remembers who she is and what she is worth. Ms. Nix – Is anything about her, or the book, based on life experience or is everything purely fictional? Author Saundra – It’s purely fiction. Ms. Nix – What, if any, were the challenges you faced writing Pieces of Justice? Author Saundra – No, actually I didn’t face any challenges. Ms. Nix – How did you come up with the title? Author Saundra – I came up with a few titles that kind of centered around the name (Justice), the main character. After a little consulting with my publisher, Tamika Newhouse – being the genius that she is. LOL!!! Pieces of Justice. Ms. Nix – Who is your favorite character? Author Saundra – Kiki is my favorite character. I loved Kiki, personally, she was funny and kept it one hundred! Ms. Nix – Are you planning a book tour to promote Pieces of Justice? Author Saundra – I do have some book signing dates lined up but at this time there is no official tour. Ms. Nix – Where can readers purchase a copy of Pieces of Justice? Ms. Nix – Do you have any advice to give aspiring writers? Author Saundra – Don’t rush, be patient, and do your research. Ms. Nix – Is there anything you would like to say to your readers and fans? Author Saundra – Thanks for the support, it means a lot to me and my family. And to readers who have not read, “Her Sweetest Revenge,” or “Pieces of Justice,” give them a try. They are true page turners; I promise you won’t be disappointed. You’ve just read the interview, no go pick up the book! Let Saundra take you on a journey through Justice’s eyes. Also make sure to visit Delphine Publications to see upcoming titles offered by Saundra. Thank you Saundra and Tamika Newhouse (Delphine Publications) from Ms. Nix and the Mix Team. You’ve given our readers a new Mix Experience. 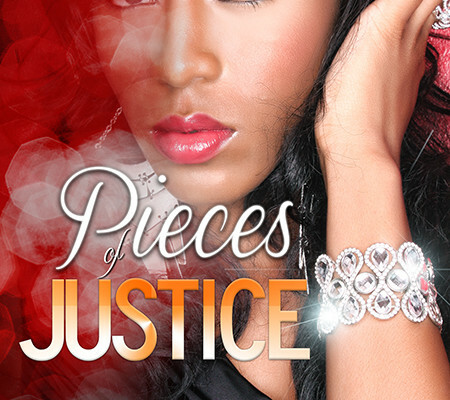 Be sure to keep checkout, #Pieces of Justice,” Twitter chat on Thursday, June 27, 2013 at 4pm PST/7pm EST.